Fred Richardson in action for Northants. 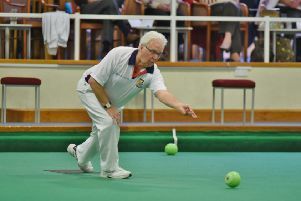 Northants are through to the final of the English Bowling Federation’s Adams Cup, the men’s inter-county championship, for the first time since 1959. Requiring just 13 points from their final match at home to Hunts to overhaul southern section leaders Norfolk, they booked their ticket to Skegness in style with an emphatic 183-132 victory and with it a twenty point haul. Northants have only ever reached the final twice – 1959 and 1929 – and lost both, so if they can defeat northern champions Northumberland on Sunday, August 23, then they will create a slice of county history. Judging by Saturday’s performance at Whittlesey Manor, there’s plenty of confidence running through the camp, but no-one envies the job of non-playing team captain Cliff Watson as he sits down to ponder over his final selection of 18, having used around 24 players during the successful qualifying campaign. The Blackstones trio of Adam Warrington, Jon Earl and Martyn Dolby were missing on Saturday as they were qualifying for the national finals of the Bowls England triples by winning their Lincs county semi-final, having lost in the fours earlier in the day with young Stephen Harris. So desperate was Harris to play against Hunts that he made a sixty-mile dash back from near Grantham, arriving with just a few minutes to spare, and he finished on the highest winning rink with Fred Richardson and Lee Welsford. The outcome was never really in doubt with Northants building a 70-45 lead after 10 ends and 125-86 after 20 before coasting to a 183-132 win. The Newton Trophy team concluded their campaign with a 190-148 victory over Hunts at Parkway to finish third in the southern section. Sean Fenlon, Bob Warters, Roger Martin won 31-26. Martin Stokes, Nick Wilkie, Paul Buckley lost 19-22. Paul Dalliday, Neil Wright, Simon Law won 30-25. Roger Stevens, Martin Bailey, Martin Welsford won 28-23. Steve Roden, Graham Agger, Barry Lawrence won 38-19. Stephen Harris, Fred Richardson, Lee Welsford won 37-17. Jeff Clipston, Mick Greaves, Brian Bassam won 35-21. Les Sharp, Jim Ruddy, Malcolm Squires won 29-19. Mike Ramsden, Mick Linnell, Rod Maplethorpe lost 26-29. Howard Shipp, Martin Bailey, Peter Jessop won 35-24. Andrew Grief, Peter Holmes, Fred Addy won 30-22. John Holroyd, John Hadley, Roger Strong lost 31-33.